A NASA worker who fell to his death from a space shuttle launch pad in March jumped on purpose, Florida's Brevard County Medical Examiner has ruled. On March 14, James D. Vanover, 53, a swing arm engineer for NASA contractor United Space Alliance, died after falling from Launch Pad 39A at Kennedy Space Center in Cape Canaveral, Fla., where the space shuttle Endeavour was being prepped for its last liftoff. According to the autopsy report, Vanover "deliberately jumped" from Level 215 of the Launch Pad structure, falling about 130 feet (40 meters) to his death on a platform below. Security cameras captured the incident. Vanover had a clinical history of depression, with evidence of use of antidepressant medication. He was worried about going blind, and had also recently been laid off from his job, the report indicated. "Obviously, we're saddened by bringing up his death once again, having to reopen a wound that’s not totally healed yet, but people are professionals, they're doing their jobs and are personally mourning for him and his family," NASA spokesman Allard Beutel told SPACE.com. Vanover apparently thought he was losing his eyesight because of high blood pressure, and had reported distorted vision, dryness and pain in his eyes. However, the autopsy found nothing wrong with his eyes. Vanover "had a note in his wallet to his wife and children, telling them that he was going blind from HBP and did not want to be a burden to them," according to county medical examiner Dr. Sajid Qaiser's report. Investigators found that he "had been depressed lately and drinking heavily." Vanover had also agreed to a compensated layoff from United Space Alliance about two to three weeks before his death. The contractor has been drastically downsizing as the space shuttle program draws to a close. It expects to lay off almost 50 percent of its employees – up to 2,800 workers – after the shuttles retire this year. Vanover had apparently changed his mind after agreeing to leave the company, but was unable to get his job back. Endeavour has not yet launched on its final mission. 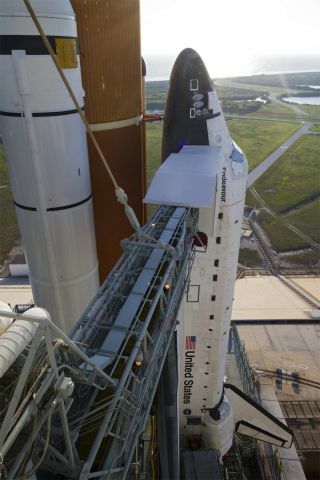 The shuttle was due to lift off April 29, but a power glitch forced NASA to call the launch off. Mission managers are meeting today (May 6) to discuss setting a new launch date once repairs are complete. After the shuttles complete their final missions, they will be sent to museums for public display.